This is Karadorde Petrovic aka “Black George”. He’s 33 years old and living in a turbulent time in a turbulent place. Serbia is a Balkan country just SE of Austria. It is owned by the Ottoman Empire. The Empire owns all of the Balkans but it is in trouble. Turk army leaders in the area (Dahis) have rebelled against the Sultan and have set up shop here and Bulgaria to the east. 11 years ago, the Sultan had tried to pacify the land with his first reform ferman (decree). He followed that up in 1795 with another reform bill. The Dahis ignore that along with the Sultan’s rule. In fact, their rule over the Serbs is harsher than ever. The country is seething; their nobles plot action. But ten days ago, on February 4, 1804 the Dahis acted with a brutal plan of killings. This day is remembered by Serb historians as “The Massacre of the Serbian Knights”. But they missed one. Black George and his men surprised the assassins sent to kill him. When the fight was over, he was alive. The assassins were dead. 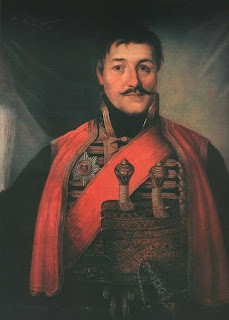 Today, February 14, 1804 the remnants of Serbia’s leaders met at a small village of Orasac and elected the tough guy, Black George their leader. The fight for Serbian independence was on.